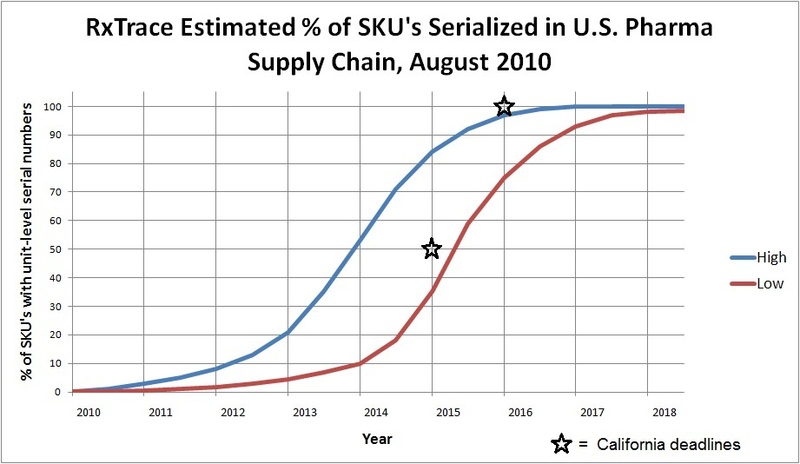 I think the future is a little less murky now because, since 2005, pharma manufacturers are increasingly facing serialization requirements from around the globe, in addition to the one in California. From my observation, more and more, manufacturers are viewing the addition of unit-level serialization as just another regulatory cost of doing business globally in the future. The pharmaceutical markets in Italy, Turkey and Brazil (countries with drug serialization requirements) are small enough that manufacturers can deal with them by adding the serial numbers to their packages as the drugs first arrive in country, even though that’s not very efficient. But the U.S. market is different. It’s the largest market for pharmaceuticals in the world. A serialization requirement that will take effect in 2015 and 2016–even one that affects only those drugs entering California–cannot be handled in that same way. The California law has become the trigger that leads many manufacturers to draw up plans for adding the necessary systems to all of their packaging lines so that they can apply serial numbers as efficiently and as flexibly as possible–and for all markets. And manufacturers aren’t just going to serialize the portion of their production that ends up in California either. How could they know which ones will and which ones won’t. They will have to serialize (and pedigree) all drugs in the entire U.S. market so they can ensure that those that do make it to California are properly serialized (and pedigreed). For this to work, standardization is essential, and that’s one reason why the FDA’s Standardized Numeric Identifier (SNI) guidance of this past March and its alignment with GS1 identification standards is so important. Everyone hopes this will cause governments around the world to adopt the same, or at least a compatible, approach. That’s the only way to guarantee true global traceability. Last weekend, I created a new graph that contains my latest prediction. This time it’s based on the known deadlines contained in the latest California Pedigree Law. Pharma manufacturers whose drugs will be sold to California residents must apply serial numbers to all of their packages that make it to that state after January 1, 2016. By January 1, 2015 they are supposed to have serial numbers on 50% of their drugs that enter the state (the definition of 50% is left up to each manufacturer). Of course, they also have to start an electronic pedigree for each one too. This is just an educated guess that I’m making publicly so that, someday, we can all see how close it comes to the reality. Of course, you will have to allow me to change my prediction if any of a number of things happen before 2016. The problem is, it will be near impossible to measure the percentage of actual serialized product in the U.S. supply chain with any degree of accuracy unless some authority is willing to release statistics. So we may never know for sure how the industry is progressing toward these deadlines, but I think we will start to get a feel for it as time progresses from here on. SO IF IT’S JUST A GUESS AND YOU CAN’T MEASURE PROGRESS, WHAT’S THE POINT? That’s a good question. I think it has significant value as a prediction because it shows what must happen if there is any hope of widespread compliance with the California law by these deadlines. It gives us a yardstick to measure progress against (assuming someone releases statistics). And if we don’t start seeing the percentage of drugs that are serialized in the supply chain begin to rise soon, I think the industry risks missing the deadlines. That’s because it takes so much time for a large company to add reliable serialization capability to a single line, if they aren’t making progress soon, they may eventually run into shortages of talented and qualified individuals who can help them get done on time. I predict (another guess!) that the demand for such people will begin to exceed the supply sometime in 2012. After that you will only find the “B” teams available. But it also gives us a picture of what may be about to happen in the U.S. pharma supply chain. Supposedly lots of serialized products will start to appear in the supply chain in the next few years. If you have confidence that this is an accurate statement, then perhaps you might begin working on some non-compliance application that can take advantage of that amazing resource: large-scale, unit-level serialization of drug packages. I’ve already predicted that it may eventually result in a transformation of the drug wholesaling business. The rise in unit-level serialization is the first step in the sequence of events that would lead there. What is your prediction? Leave a comment below. Dirk: In issues regarding authentication and tracking, the issue from my perspective has always been predicting WHEN things would happen, and in the 25 years I’ve been involved in this, it has always been “slower than expected”. While CA is obviously the catalyst here, I don’t know if there’s anything that would prevent another postponement of its implementation, especially if there’s enough pressure from the right quarters to do so. It will be interesting to watch this unfold over the next few years. I admire your optimism and willingness to be specific. A good forecaster is not smarter than everyone else; he merely has his ignorance better organized.